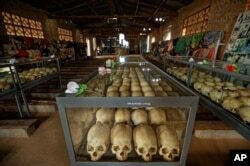 Skulls of some of those who were slaughtered as they sought refuge in the church sit in glass cases, kept as a memorial to the thousands who were killed in the 1994 genocide in Rwanda. 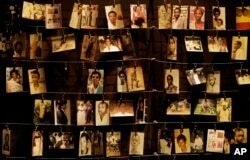 Family photographs of some of those who died hang on display in an exhibition at the Kigali Genocide Memorial centre in the capital Kigali, Rwanda, April 5, 2019. 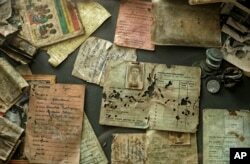 The belongings of some of those who were slaughtered as they sought refuge in the church are preserved in glass cases as a memorial to the thousands who were killed in the 1994 genocide in Rwanda. 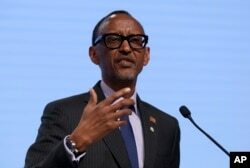 FILE - Rwanda's President Paul Kagame addresses the media during a press conference. 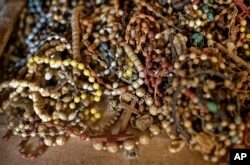 A pile of necklaces and crucifixes belonging to some of those who were slaughtered as they sought refuge inside the church sit on the altar as a memorial to the thousands who were killed during the 1994 genocide in Rwanda. 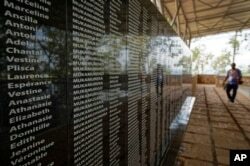 The names of those who were slaughtered as they sought refuge in the church, many with the same surname indicating a family, are written on a memorial to the thousands who were killed in the 1994 genocide in Rwanda.